When I was a kid in the 70’s there was a place in Ireland we used to hear about on the news, in black and white of course, called Belfast, and back then I thought it must have been Africa or Israel or somewhere, because wherever it was, it was one of those far away countries in the throes of war. But Belfast really was in Ireland and what was going on there were ‘the troubles’, which is a word the Irish use for war when it’s happening in their own country. By the 80’s I knew a bit more, and I did take a trip to Belfast, not on a political mission or anything, it was to buy a telly and condoms. When we headed down the main shopping streets we were frisked by armed soldiers and I vaguely remember a lot of barbed wire and wasteland. Two years ago, I was invited back there to represent Connacht in the BBC4 All Island poetry slam. ‘All Island’ is the new word for ‘Ireland including Northern Ireland.’ It was a riot, but not like the riots back in the day. The audience were a bit rowdy, but they were great, and after the event there was a mad open mic. session where people just grabbed the mic. and recited their own poetry or other peoples poetry or sang a song or just ranted on about something or other. Some Arts organisation put us up in an apartment near town, and even though there were only two beds for about ten of us, the beds weren’t really that necessary because most people didn’t get to bed at all. It wasn’t until last year that I managed to get to see Belfast by day: a mix between steamy chip shops, trendy European Boulevards and the odd bit of wasteland here and there. I gave a reading in some pub and I didn’t dare ask what part of town I was in, I just pretended to be really cool about the whole thing. But it was only last week that I really saw Belfast, and that’s when I fell in love with the place. Pulling into the bus station brought back all the nostalgia of travelling through Siberia twenty years ago, and it’s great when you start to get to know a place. I was able to tell a few tourists on the bus that the Hotel Europa at the station is the most bombed hotel in the world. Belfast just started feeling like home. Later that day, a taxi drove me to the West Club on the Falls Road. Housing estates, the famous Divis flats and mural upon mural (Derry eat your heart out) For some reason I love this place. I love the betting shops, the chippers, the cheap hairdressers and the net curtains on houses. You really don’t need the Bobby Sands memorials or the half peeled away ‘join Sinn Fein’ posters to know you’re in Catholic Belfast. Even the yelping dogs on the street have a catholic look about them, and the virgin Mary gives you the eye that only a catholic virgin knows. 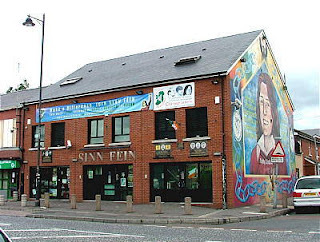 The West Club on the Falls Road is full of middle aged working class men and women and all of them know how to dress well. The women are actually able to walk in their heels and there’s enough jewellery flashing to give the place the feel of Christmas. And this is why I love Belfast. Where else in the world do ordinary every day people fill a place in the middle of the day to listen to poets? In a way I feel small, because every piece I read could surely only be a shadow on what some of these people could write about if they weren’t busy doing real life things. There are no hecklers, drunks or smart wannabe poets like me, and I’m glad I’ve downed two gins for my nerves when I spot Gerry Adams in the audience. They’re a great audience and I’m loving it, but still, I do want to be on the right side of them. It ends on a high when Gerry Adams buys my book and asks me to sign it. I mean, Gerry Adams asking for MY signature. Leaving the West Club was a total anti-climax. I didn’t want West Belfast to be over for me, but it was. I left early next morning with a rotten hangover and an appointment in Budapest. Arriving in Budapest at dusk and greeted by illuminated castles and bridges was an experience. But my heart was still in Belfast. Who cares about castles when you could be booking into a wee room in the Europa Hotel? A Head of Lettuce for €200?